Watch year: 2016. All images shown are of the actual watch. 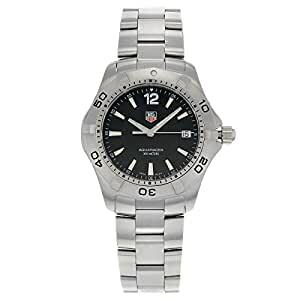 THIS TAG HEUER AQUARACER WAF1110.BA0800 IS A BEAUTIFUL MEN’S TIMEPIECE THAT IS POWERED BY A QUARTZ MOVEMENT WHICH IS CASED IN A STAINLESS STEEL CASE. IT HAS A ROUND SHAPE FACE, DATE DIAL AND HAS HAND STICKS & NUMERALS STYLE MARKERS. IT IS COMPLETED WITH A STAINLESS STEEL BAND THAT OPENS AND CLOSES WITH A FOLD OVER CLASP WITH SAFETY. . BUY WITH CONFIDENCE KNOWING EACH TIMEPIECE GOES THROUGH THE SAME RIGOROUS 31-POINT INSPECTION. REST ASSURED ONLY AUTHENTIC PARTS STRAIGHT FROM THE MANUFACTURER ARE USED. THE CERTIFIED PRE-OWNED PROGRAM ON AMAZON ENSURES PEACE OF MIND AND TRANSPARENCY VIA STANDARDIZED REPORTS AND A 1 YEAR WARRANTY PROVIDED BY WATCHFACTS.